A few years ago, my mother gave me a set of fat quarters from the Tasha Tudor "A is for Annabelle" fabric collection. 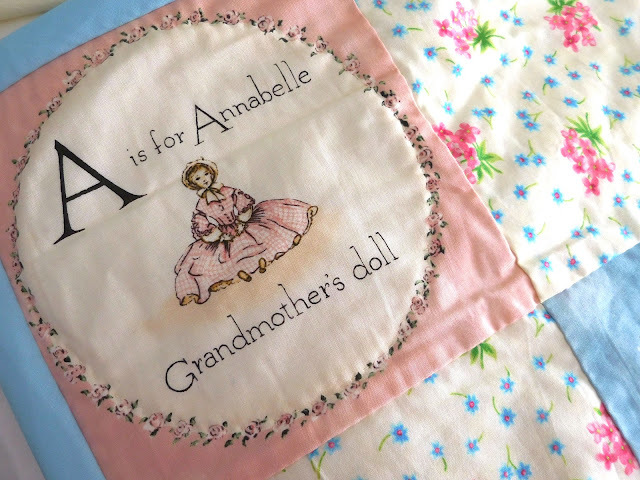 I love Tudor's illustrated children's books, and A is for Annabelle is one of my absolute favorites with its delicate pink color scheme and fascinating details of an old-fashioned doll and her wardrobe. One of the fabrics in the collection is a sheet of alphabet blocks taken directly from the book illustrations, and the fat quarter collection generously contained the full set. The block shapes instantly suggested a patchwork quilt to me, but I had never made a quilt before and had only a vague understanding of the process. But the only way to learn a new craft is to try it, so I did some research, planned my design, and got in the supplies to make my first quilt. And after working on it on and off for a couple of years, I finally finished it! 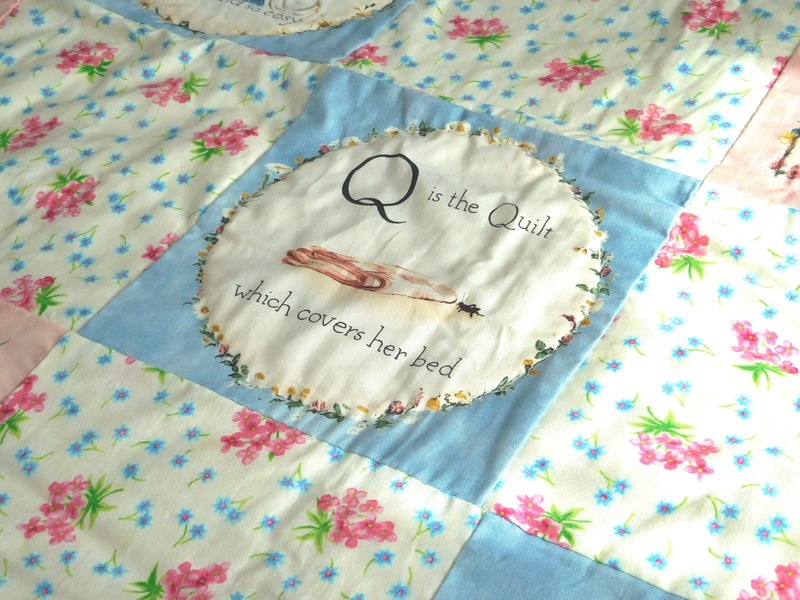 To make my quilt, I used the alphabet blocks from the "A is for Annabelle" collection alternated with squares of floral fabric from the Tasha Tudor "A Child's Garden of Verses" collection, since the rest of the "A is for Annabelle" collection had sold out by the time I was purchasing. The patchwork is seven blocks wide by eight blocks long, making a finished quilt about 52" wide by 60" long--a nice size for a throw or as a topper for a twin or full bed. 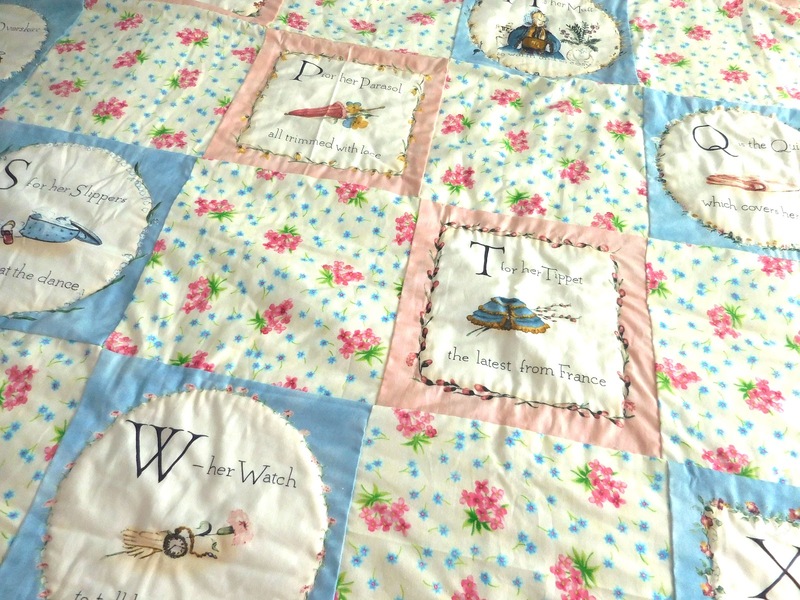 The square and circle borders in each alphabet block provided a natural shape for my quilt stitching to follow, and were just close enough together that the quilt would keep its structure without me having to stitch on the floral blocks in between. I did iron my fabric before cutting and quilting, but it still has some wrinkles here and there, which I don't mind. 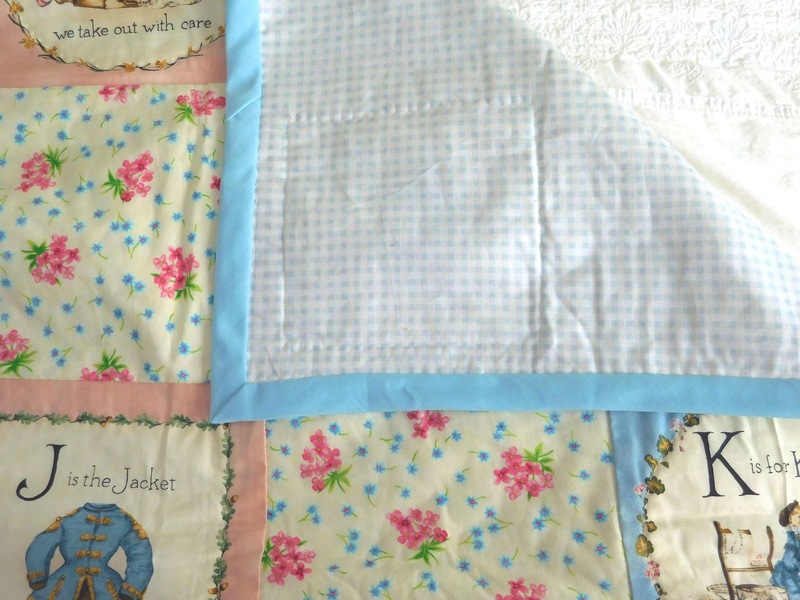 In fact, I opted not to prewash my fabric before cutting so the quilt will get an even crinklier texture when I do wash it, which I think adds to the vintage, shabby chic look. I chose a light blue gingham fabric from Joann's nursery section for the backing, and light blue pre-made binding. My binding is fairly wide because this width of double-fold bias tape was the only one marked as quilt binding from the brand I used--it was only after I bought it that I learned that most quilters use narrower widths, despite the package naming. Still, I like the border effect the wider tape gives. The batting inside is cotton, which in my opinion has a nicer weight and drape to it than polyester batting. I bought twin-size batting and cut it down to fit my quilt, since it isn't a standard size. There are definite imperfections in the finished quilt, which I think is only natural given the fact that this is my first project and it's entirely hand sewn. Some of the block corners don't line up perfectly, the stitching is a little clumsy here and there, and I'm not great at hiding knots. But I'm quite pleased with the finished project all the same, and hope it will last for years to come.